Last month marked the fiftieth anniversary of the first Holy Communion service in the chapel on Hackett Boulevard. The chapel was designed to replicate a 1940s-era memorial chapel in the Lancaster Street church building, using the older building’s memorial windows and furniture. The new chapel even uses the communion rail from the main Lancaster Street chancel. Only one new window was created for the new Hackett Boulevard chapel: the window named “Te Deum laudamus” behind the altar. It takes its name from the early Christian hymn of that name, and its donor describes it thus, mirroring the text of the hymn: “The group of figures includes saints, apostles, prophets, martyrs, and figures representing the Holy Church throughout all the world, all praising God.” The donor was William Starr McEwan, St. Paul’s vestryman, treasurer of the Hackett Boulevard building fund, and the McEwan for whom our parish hall is named. McEwan gave the window in memory of the Reverend Nelson Fremont Parke, St. Paul’s rector from July 1959 until his death in November 1962. 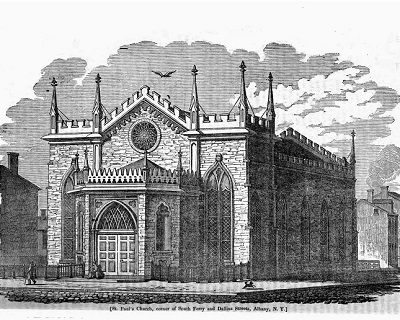 While Nelson Parke was rector here for only a little more than three years, his influence will long be felt, because it was his enthusiasm and leadership that held St. Paul’s family together in a difficult period, and and it was his powers of persuasion that convinced the State that St. Paul’s Lancaster Street building was of particular value. St. Paul’s was not a strong parish in 1959. Changes in the neighborhood and flight to the suburbs had reduced the size of the congregation and its income, and since 1954 they had been unable to support a rector. Just a year before, the outlook was so grim that Bishop Frederick L. Barry advised the vestry that calling a new rector was “unthinkable,” and suggesting a choice between merging with another parish, or continuing as before, with a priest-in-charge, while considering other options. The vestry chose to call Father Parke. Nelson Parke brought energy to St. Paul’s. In 1960, they painted the buff brick of the church façade white, with gray trim, in an effort to brighten the down-at-the-heels neighborhood. Through the summer of 1962, the congregation waited hopefully for a response from the State. As Parke suggested, they continued to maintain and improve the building, including a major renovation to the church kitchen. The plans to which Meyers referred may be the placement of the Central Air Conditioning Plant and Main Transformer Vault between Chestnut and Jay streets, an area that included the church site. Once the planners made that decision, there was no hope for St. Paul’s to remain on Lancaster Street. In this letter, Parke gives a summary of the September 12 meeting, and the vestry’s decision (with his full approval) to join the diocese in taking an option on the Hackett Boulevard property. As always, he expresses full confidence in St. Paul’s ability to thrive in this new location. The letter was to be one the last acts by Father Parke as rector. On October 17, 1962, Bishop Brown announced that Parke would take a leave of absence until January 1, 1963. Nelson Parke and wife went to Florida, where he maintained at least weekly contact with the church, eager to return. But on November 9 he died of a heart attack. His funeral was held at St. Paul’s on November 15, 1962. Father Nelson Parke played a particularly important role in his brief period at St. Paul’s, by invigorating a parish at its low ebb, by maintaining the congregation’s positive spirit in the face of the State’s plan to demolish our building, and by eloquently arguing for the importance of our presence in the the South Mall area. When the Lancaster Street building was demolished in 1964, the parish was far stronger than it would have been without him. And his advocacy for the building’s architectural and artistic merits resulted in a reimbursement from the State far higher than any other church in the South Mall area. The Te Deum window is an appropriate memorial to this good man. This entry was posted in Clergy, Hackett Blvd Building, Windows on September 19, 2016 by Paul Nance.